Once again, this is a departure for us. Growing up Chinese, cold soups are pretty much out on left field for us. 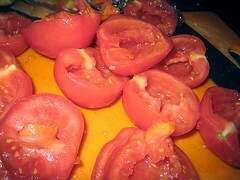 But, we had a bunch of tomatoes just getting way too ripe on the counter and I didn't feel like making tomato sauce. So, I thought of gazpacho as a way to use up not-so-supple tomatoes. 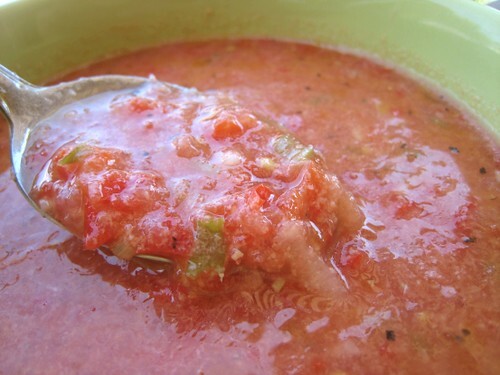 I've made gazpacho before (not for our own use/pleasure), but I didn't use bread. I decided to try to be more authentic. 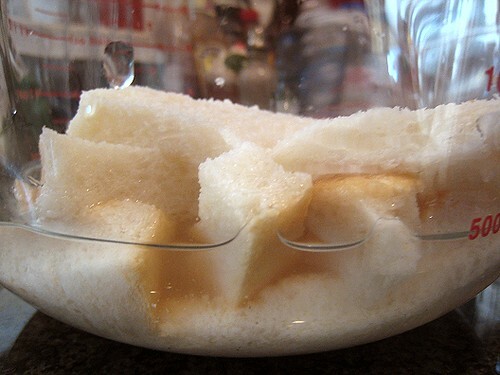 So, I set to soaking some bread. I wrung out the bread after its soak. It was quite spongy and squishy. Lots of fun, teehee. 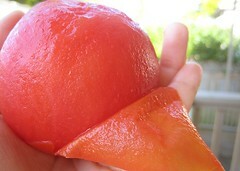 Tomato prep: Just a note, it is highly unusual for us to peel and seed tomatoes! It's one of those tasks that we place in our invented category of "martyr-ization." But, here I am, being a martyr. I was too lazy to go out and buy cucumbers. So, in terms of vegetables, this version of gazpacho had tomatoes, red bell peppers, green onions and garlic. Red wine vinegar, olive oil and water also went in. I used to dice the ingredients by hand, but this time, to make up for my tomato martyr-ization, I used the food processor. We let the gazpacho sit in the refrigerator overnight. The next day, after some seasoning adjustments, our gazpacho was served. 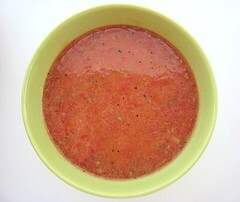 Our mother, at least, tried the gazpacho, and she is the one who is usually averse to trying "weird" and "unusual" food. I guess her love of the tomato won out when she was told that gazpacho was mostly tomatoes. 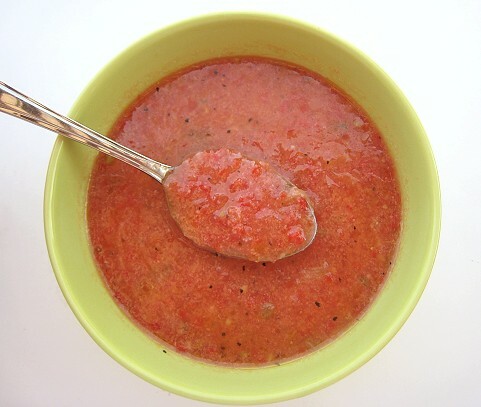 The first time I tried gazpacho years, years ago, in a restaurant, the first sip of the soup, I instinctly recoiled. I think I commented something to the effect, "Yuck." A few more spoonfuls later, it kind of grew on me and went beyond yuck, but I recall saying I would have preferred the soup heated up. LOL. I liked this gazpacho, but I would have preferred it chunkier, where I can eat the vegetables instead of drinking them. Gazpacho in general is one dish I do not at all crave. Perhaps we can try roasting the vegetables before making it into gazpacho next time. It will probably be a long time coming, since there are so many other things we want to make first. It was really good, though. Very intensely flavorful. I too would've liked the gazpacho to be chunkier. I guess I should've diced the ingredients by hand. It would've gone great with some bread (which we didn't have at the time). Or actually, with some garlic bread. Oooh. When I heard of the restriction of not using any heat, gazpacho was the prototypical non-heat-using dish I thought of. 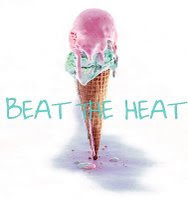 So, we're submitting this to Beat the Heat, created and hosted by A Southern Grace. I am so not sophisticated enough for cold soups. I even like my vichysoisse hot. I'm glad you are though, because the photos look great! Again, I'm completely impressed by you two. Another fantastic looking recipe - I'd definitely try this out - definitely! Chinese people really aren't down with cold soups and I guess it's the Chinese in me but I've never liked a cold soup yet, but I'm always willing to try. i never knew that authentic gazpacho had bread in it--good to know! I agree with your Dad. Soups should be hot and I mean really really hot. That's just what Chinese people are. I like mine piping hot too. I think I will only try a cold soup if it's sweet. (ie watermelon soup or blueberry soup). I will consider it as a dessert. I must admit, this year I had my first attempt at cold soup and it was so delicious......just like yours here! so glad you peeled the tomatoes yourself. It's a labor of love, really! My dad loves gazpacho and I guess I should get in the habit of making more often. The great thing about gazpachos is that you can add stuff in or leave stuff out, according to what's available. Try adding smoked paprika next time. It will give it a new depth of flavor. I know exactly what you mean with the cold soup thing. I would probably describe this as pureed salsa instead of soup. Might go down easier. I have been wanting to try a gazpacho soup for a while now. Your looks good and sounds tasty! This is too funny re the non-cold-soup stance some of you guys are taking. Haha. I was the same way... then I guess I just "warmed" up to it (pun intended). LOL. If I left it chunky and had some chips around, it would've vanished in no time at all!